Birds of America from Original Drawings. London: Published by the Author, 1827-38. Measuring 39.5” x 29.5”, Birds of America has long been recognized as one of the greatest bird books of all time. Audubon, a self-taught ornithologist and talented artist, captured his specimens in their natural habitats to secure their likenesses with brush on paper. His innovative methods of wiring them into position enabled him to sketch and paint elusive specimens, thus contributing to his accuracy. Audubon supplied his publisher with life-size paintings that were transformed into copperplate etchings and printed in black. 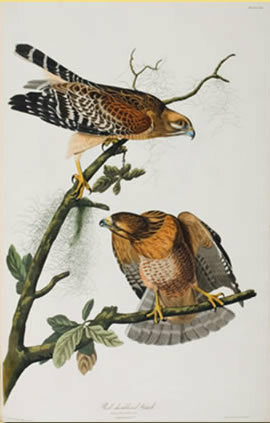 Each plate was then meticulously hand-colored according to Audubon’s specifications. In many cases, Audubon supplied the birds alone, leaving the background to either his field assistants or publisher. Over 1,000 birds appear on 435 plates, typically bound into four volumes, each with its own title page. In recognition of this remarkable work, Audubon was elected a Fellow of the Royal Society of London in 1830. Audubon was particularly proud of this association – he was the only American other than Benjamin Franklin to receive this honor – and had the abbreviation F.R.S printed following his name on the title pages of this opus.